78 3/4" x 41 1/2"
Pancho Quilici confesses to being obsessed with geometry, especially with everything related to circle, as to him this is the principle of existence. In his works, he creates places that reflect his thinking. The exhibition Just Passing By… is an epitome of his metaphysical vision. 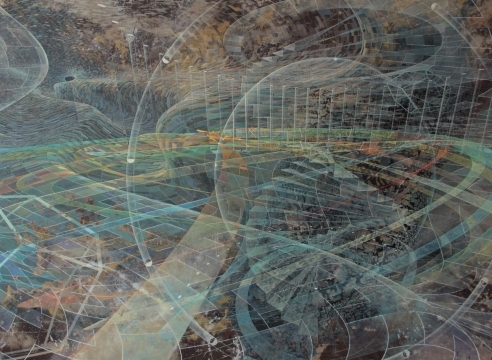 He uses geometry, architecture, land, the elements, and often works with an idea of simultaneous worlds (inside-outside, figurative-abstract, past and future, movement and stillness, drawing and painting). In Just Passing By…, Pancho Quilici explores gravitational singularity, a Physics theorem defining a location where the quantities used to measure a gravitational field become infinite. This attraction of infinity, of a perpetual and archetypal movement, is deep within us. While the artist is trying to reach this "ideal place", the present world fades away and leaves only little fragments here and there, like notes and remarks made around and about the process. Pancho Quilici observes that the process is like having a hidden language that he tries to understand and reveal.